Earlier this month, listings for a fantasy 10 pound Scottish banknote featuring Arthur Conan Doyle began appearing on some of the major online auction services. 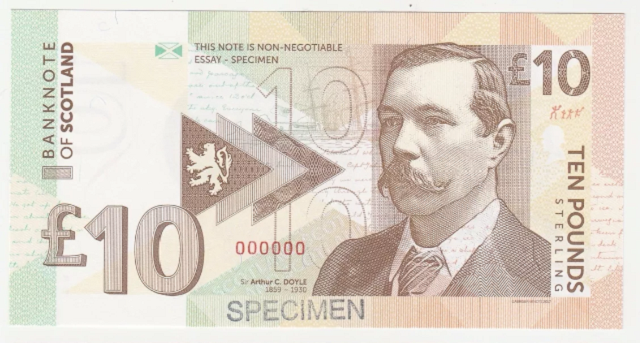 The front of the note features a left-facing portrait of Sir Arthur Conan Doyle. In the background, appears to be the manuscript of Life on a Greenland Whaler in Doyle’s handwriting. In the upper right hand corner of the note, below are four characters in the font from the Adventure of the Dancing Men story. A six digit serial number is overprinted in red ink. 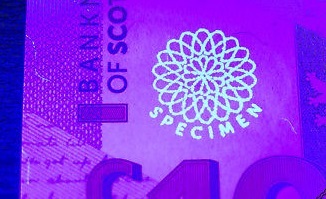 For those with an ultra-violet light, you will be able to view a “watermark” on the front of the note on the left side of the note. The back of the note features a whaling ship anchored among some small icebergs and the statue of Sherlock Holmes that is erected in Edinburgh. The note references DOYLE’S VOYAGE TO ARCTIC ON THE “HOPE” WHALER SHIP with the dates of FEBRUARY – SEPTEMBER 1880. The notes also reference EDINBURGH with a date of 18th September 2017. 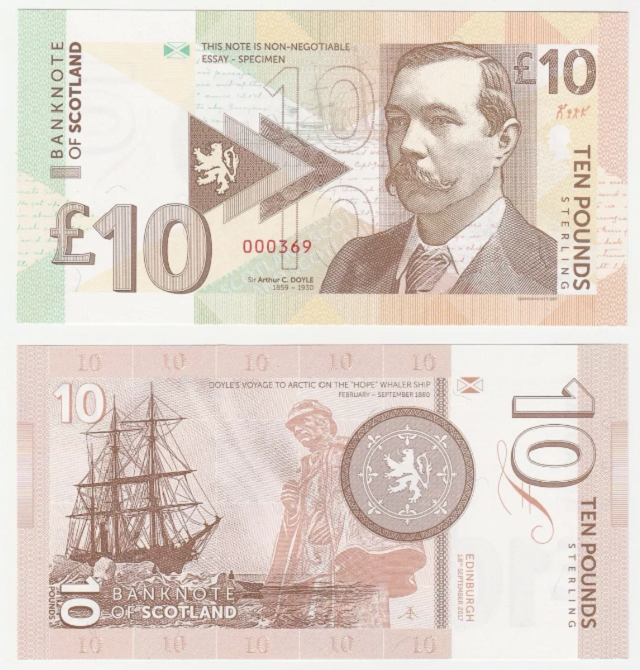 The notes simply state BANKNOTE OF SCOTLAND and clearly states THIS NOTE IS NON-NEGOTIABLE ESSAY – SPECIMEN. These notes measure 130 mm by 67 mm and are offset printed in the Czech Republic, with 600 notes manufactured. Below Doyle’s portrait is GABRISBANKNOTE2017. Gabris Matej is the designer of these notes and you can read more about him HERE and view many of his other creations HERE. In a somewhat ironic twist, some of his previous fantasy notes have been reproduced and sold by others online — “counterfeits” if you will. Already, multiple vendors are selling this note a wide range of prices being offered. 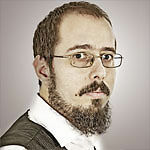 Matej’s online shop at a major online auction site can be found HERE if you wish to deal with the creator of the note. Currently, there is an example of this note offered online with the serial number of 000000 and has been stamped SPECIMEN. We mention it here in the interest of completeness. In the January 1897 issue of The Strand Magazine, Doyle authored Life on a Greenland Whaler, based on his experiences from the seven months in 1880. You can read that story HERE.